Are you ready for a little rest and relaxation? 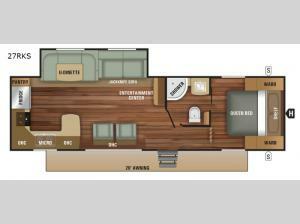 Come camp with this 27RKS Autumn Ridge Outfitter travel trailer and enjoy all of the space inside! The unique rear kitchen is fully equipped with a large refrigerator, a three burner range, plus a double sink which makes cleaning up a breeze. There is also a bit more counter space here so prep for meals is easier. In the living area you can come relax at the two lounge chairs, the jack knife sofa, and eat your meals at the u-dinette. Outside the 20' awning provides plenty of shade so now you can spend more time outdoors!